Since February I am at the Centre for Textile Research (CTR) in Copenhagen and started working on my project Periphron Penelopeia. 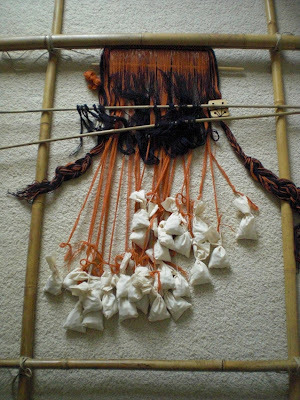 In my project I intended to do some practical weaving but this is not a task that fits into the office space of a university. So I went home to Germany for one week. There I have a room to work in and there I set up a loom that is meant just for doing experiments on some technical aspects of weaving on a warp-weighted loom. 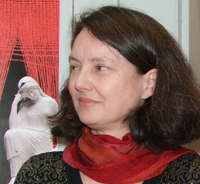 It is not a reconstruction of the materiality but of the techno-logic of weaving in antiquity. In summertime you can buy cheap stuff for the garden - or for an experimental loom. 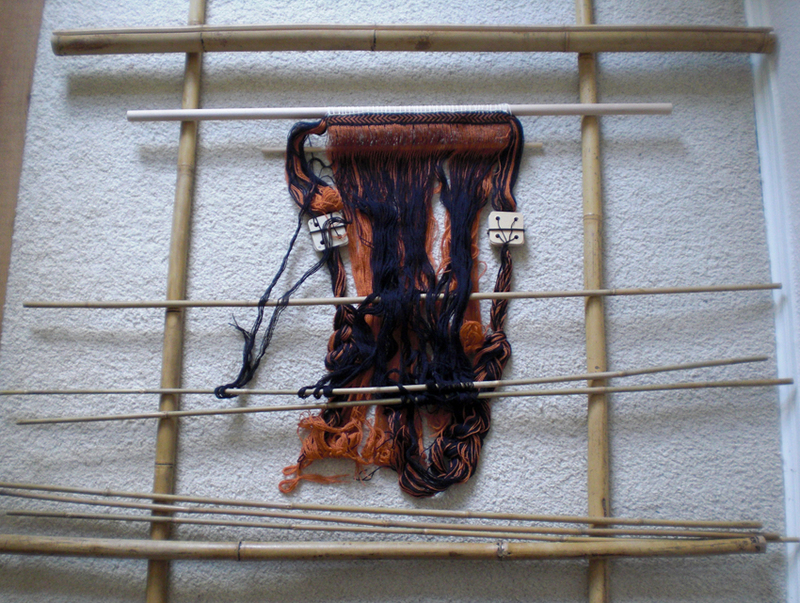 In the first picture you see a lot of Bamboo sticks in different diameters to be used as posts, heddle rods or just sticks for picking up the warp threads when patterning the fabric. The only stick that should be really straight is the one that will carry the headband of the fabric. Here this tablet-woven band is already fixed to this stick that will be inserted into the hollow bamboo rod on the top. See details in the second and third picture. In the end the weights are knotted to groups of warp threads. 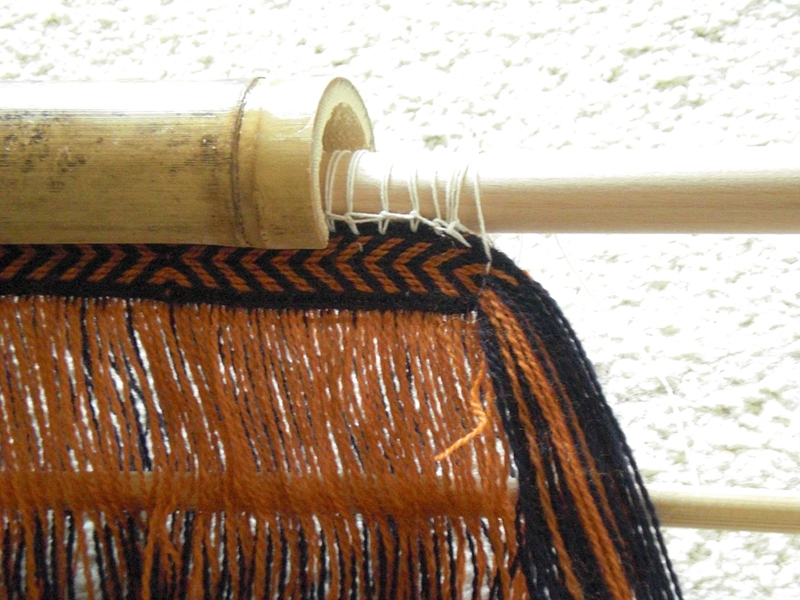 These are ordered according to the distribution of threads on four shafts for a double tabby weave (fabric with dark and light side). The small cotton bags used as weights are each filled with ca. 100g gravel stones. 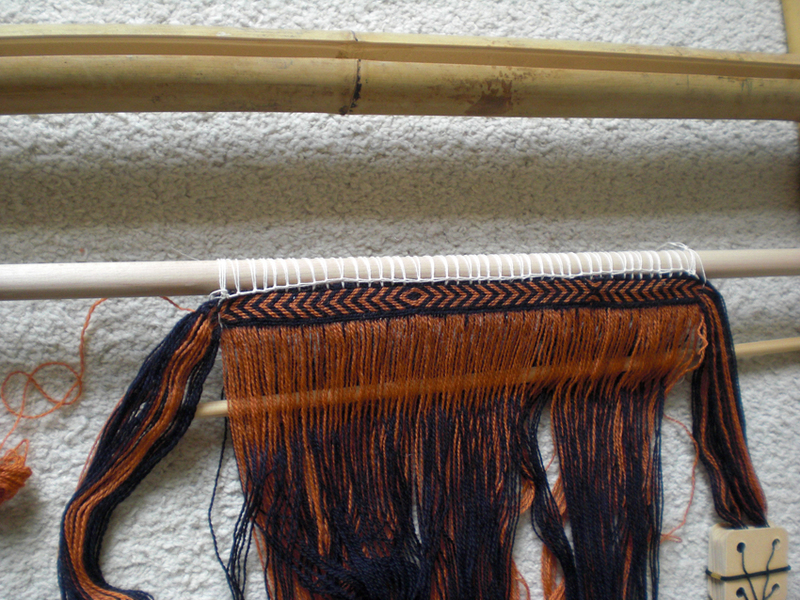 The tablet weaving will go on at both sides of the weave. I did not really set up the loom, because now I have to decide on the patterns to weave and look through all the marvellous books of CTR and through my collection of textile patterns from vase paintings. 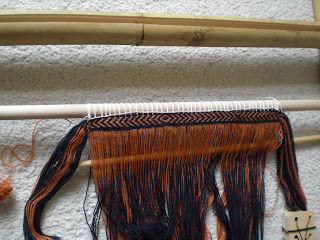 Then I will decide what to weave when I go back to my little weaving workshop in Germany in August. Thank you for the offer. I will post a link as soon as I have new photos. I am busy with other things at the moment.